These are estimates of the sales on graphic novels by Diamond U.S. to comic specialty stores during March 2015. 2 Page Heroes Spread $ 10,000.00 On 1 Single 17"x 22" Board. There will be additional shipping cost on this item due to size. The various changes made in the Infinite Crisis hardcover edition have been making the rounds on various message boards (along with this double page spread re-drawn by George Perez). Finally, in the interview in the end, Anton Kawasaki brings up IC #6 and "New Earth". Geoff Johns replies: "We always knew we were going to do something with New EarthS. THEY'RE important to "52". Big revelations there" (Emphasis mine). No, what I realized, upon reading the recently-released collected edition of DC’s mini-series, was that there are a great number of additions, subtractions, and changes to the story. Lines of dialogue altered, artwork tweaked, whole pages added, and a really cool surprise at the end of the story. In short, enough reason for me to break out my issues of Who’s Who and my magnifying glass and get all nit-picky. Okay, the two-page spread of the heroes of the DC Universe by Joe Bennett in IC #7 was good. Not great, but good. This one, by George Pérez, isn’t great. It’s absolutely fantastic. Bennett’s depicted 85 heroes…the new one showcases 116. And the one thing that Pérez does, better than any other artist, is that he not only can draw an army of characters racing towards you, but he also grounds them in the same plane. They interact. Fly together, race one another, climb on one another’s bodies. It’s not just a flat piece of artwork. Rather, it’s a true snapshot of these characters. The 7-issue miniseries event that rocked the entire DC Universe in 2005-2006 - a sequel to the epic CRISIS ON INFINITE EARTHS - is now collected in an amazing hardcover collection! 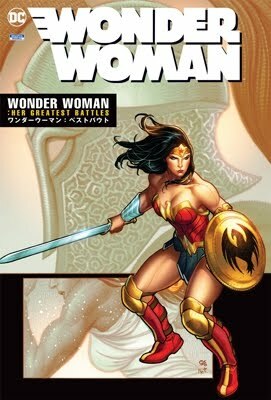 Written by Geoff Johns (GREEN LANTERN, TEEN TITANS) with art by a who's who of comics' greatest talents - including Phil Jimenez, George Pérez, Jerry Ordway and more, this hardcover is a must-have for any DC collector. OMAC robots are rampaging, magic is dying, villains are uniting, and a war is raging in space. And in the middle of it all, a critical moment has divided Earth's three greatest heroes: Superman, Batman and Wonder Woman. It's the DCU's darkest day, and long-lost heroes from the past have returned to make things right in the universe...at any cost. Heroes will live, heroes will die, and the DCU will never be the same again! This exhaustive volume also contains every cover and variant produced for the project, annotations, character designs, excerpts from scripts, unused scenes, and much more! The following products are expected to ship to comic book specialty stores this week. Note that this list is tentative and subject to change. Please check with your retailer for availability. The following products are expected to ship to comic book specialty stores next week. Note that this list is tentative and subject to change. Infinite Crisis HC is now scheduled for October 11th, while Series 1 of the Infinite Crisis Action Figures are set to be released on September 27th. This item has not yet been released. You may order it now and we will ship it to you when it arrives. Ships from and sold by Amazon.com. It's alternate-Earth anarchy as Doctor Strange, Captain Marvel, Ghost Rider, Spider-Woman, Nova and Shang-Chi are turned against humanity when fate is tossed a twist by that infamous question mark! Plus: The Howling Commandos fight for Earth, and Spider-Man fights for... ratings!? Featuring the Fantastic Four, Daredevil and Hellstorm! Collects What If? #14-15, 17-20. INFINITE CRISIS is the hardcover collection of the hottest story in comics: one that changes everything you know about the heroes and villains of the DC Universe. Four heroes, trapped in limbo since the original CRISIS ON INFINTE EARTHS, are about to reveal themselves: one is dying, one wants to save her and restore an entire world that vanished and the other two seek unrivaled power. The plan they concoct is literally earth-shattering, and the world’s greatest superheroes may not be enough to stop their attempt to alter the very nature of reality. This special edition features artist sketches, a cover gallery and lots of behind-the-scenes information, making it the must-have collection of this soon-to-be-legendary event in comics history. New story pages. New Phil Jimenez art. New George Perez art. A look at deleted scenes and sequences. What more can a fanboy want out of an Infinite Crisis hardcover edition? DC’s mega-crossover, which the company had been building to for over two years, is being collected in a special hardcover edition this September. And when we say special, we mean special. Aside from collecting all seven issues, the volume will contain four all-new story pages drawn by Jimenez, Andy Lanning and Art Thibert. These additional pages are a two-page spread of 80 heroes paying homage in a church that fits neatly into issue #5 of the series, a battle sequence between Batman, Robin, Nightwing and Deathstroke from issue 7 and a scene showing the final fate of Nightwing and more of the epic battle in Metropolis from the same issue, said editor Anton Kawasaki. Not enough for you? How about a new double-page spread of all of DC’s heroes drawn by Perez? Also in this hardcover edition will be a collection of all covers from the series, including variants. There will also be a discussion about the book with writer Geoff Johns, Jimenez and editor Eddie Berganza with a look into sequences and art that fell on the cutting-room floor before publication, according to DC editor Bob Harras. Written by Geoff Johns, art by Phil Jimenez, George Pérez, Jerry Ordway, Ivan Reis, Andy Lanning and others, new cover by Jimenez. The 7-issue miniseries event that rocked the entire DC Universe in 2005-2006 -- a sequel to the epic Crisis on Infinite Earths -- is now collected in a hardcover collection! This exhaustive volume also contains every cover and variant produced for the project, annotations, character designs, excerpts from scripts, unused scenes, and much more! 264 pages, $24.99, in stores on Sept. 20. Written by Marv Wolfman, art by George Pérez, Romeo Tanghal, Brett Breeding and others, cover by Pérez and Tanghal. A volume collecting The New Teen Titans #17-20 and Tales of the New Teen Titans #1-4. The Titans help Kid Flash's possessed girlfriend, reunite with the original Starfire, team up with the Winged Wonder, Hawkman and much more. 228 pages, $49.99, in stores on Oct. 11. The 7-issue miniseries event that rocked the entire DC Universe in 2005-2006 - a sequel to the epic CRISIS ON INFINITE EARTHS - is now collected in an amazing hardcover collection! Written by Geoff Johns (GREEN LANTERN, TEEN TITANS) with art by a who's who of comics' greatest talents - including Phil Jimenez, George Pérez, Jerry Ordway and more, this hardcover is a must-have for any DC collector. This exhaustive volume also contains every cover and variant produced for the project, annotations, character designs, excerpts from scripts, unused scenes, and much more! For a signed edition, se the Dynamic Forces section of Previews. INFINITE CRISIS, the incredible, bestselling miniseries that rocked the DC Universe, will be collected in an amazing hardcover collection in September! Written by Geoff Johns, with art by comics talents including Phil Jimenez, George Pérez, Jerry Ordway and more, this hardcover contains every cover and variant produced for the project, annotations, character designs, excerpts from scripts, unused scenes and much more! And the INFINITE CRISIS HC is just one of the amazing DCU collected editions scheduled for publication by DC Comics this fall. Also coming from DC Comics is the SACHS & VIOLENS TP, collecting the 1993 written by Peter David and illustrated by George Pérez. The list also includes new Archives and Showcases, as well as titles from DC's Elfquest and Will Eisner Library!